Has your company ever forgotten to change the main greeting on your business line so that weeks after a major holiday, callers still only hear a greeting with seasonal hours and special sales? Or, perhaps your business has grown, but the options on your phone tree still only reflect the original members of team, by name. It’s important to refresh your phone system on a regular basis – not only to avoid the embarrassing examples above, but also to stay on top of your caller’s needs. Your phone system plays a large role in the first impression of your organization. You don’t want callers to be turned away before they truly understand the value of your product or service offerings. Callers do not like to reach phone trees that only list employees by name or take too long to find the right information. Both of these cause frustration for callers and they react by hanging up before resolving the reason for calling. Think through your business from the eyes of your customers. What are the most frequent reasons for calls? Set up your phone tree to reflect these reasons instead of using an organizational system that only makes sense to your internal team. Keep phone trees simple. Research shows that the structure should include no more than five options in the top menu and no more than three submenus deep. Anything more complicated that this has a tendency to anger and frustrate callers. Include self-service options in the top menu. Don’t bury hours, location, or other commonly requested information deep in a sub-menu. Your callers will lose patience before they find the answer they were searching. 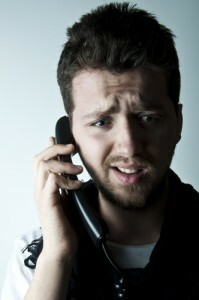 Many callers want to talk to a “real” person. Set up your routing so that the caller gets directed to a live person and not immediately to a voice mailbox. Make sure that one of your phone system options includes a dial by name directory so that callers can say or dial a few of the letters of an employee’s first or last name to be routed to the correct person if they have a specific contact within your organization. Have a recording for callers to listen to while they are on hold. This will re-assure them that their call has not been dropped. Use this on-hold time wisely. Instead of insisting on how important their call is to you (while they’re on hold! ), answer commonly asked questions, or describe a new product or service. This entry was posted in Auto Attendant, Customer Service, Small Business by Heather. Bookmark the permalink.